Because our regular Numenera Game won’t happen due to absence of a player, our GM Michael (aka Stargazer) decided to run a one shot set in TOS era Star Trek. He settled on “Where No Man Has Gone Before” as the system to run it with, and what a great choice. WNMHGB is the best portrayal of TOS era shenanigans I have seen so far. The whole game oozes the flair of the early TV show. And it is a free labor of love as well. The creator, Mike, took the Microlite20 System and tweaked it perfectly to represent the adventures so many of us fondly remember. I like it so much I updated the PDF to include Bookmarks and a proper ToC and created some new character sheets. If you like you can check it out at Abillionmonkeys WNMHGB Page. But this post is not primarily about WNMHGB (even though it is fantastic, go read it already) but rather the underlying system: Microlite20. To my shame I must admit I had never heard of it before WNMHGB. In the basic M20 rules there are only 3 Attributes: Strength, Dexterity and Mind. The classic classes are all there. Additionally it uses a skill system with only 4 broad skills: Physical, Subterfuge, Knowledge and Communication. Spells cost HP to cast. Resolution is still D20 plus modifiers vs DC. And that’s it, small, lightweight and easy. The original version fits on a single page as a pocketmod. It is obvious Microlite20 is a fantastic base to expand on for your own needs. It manages to stay compatible with most OGL material with no effort while removing the excess baggage the 3.5 era had. A quick google search turned up the official page http://microlite20.net/ , it is not really that helpful and sadly often down lately. 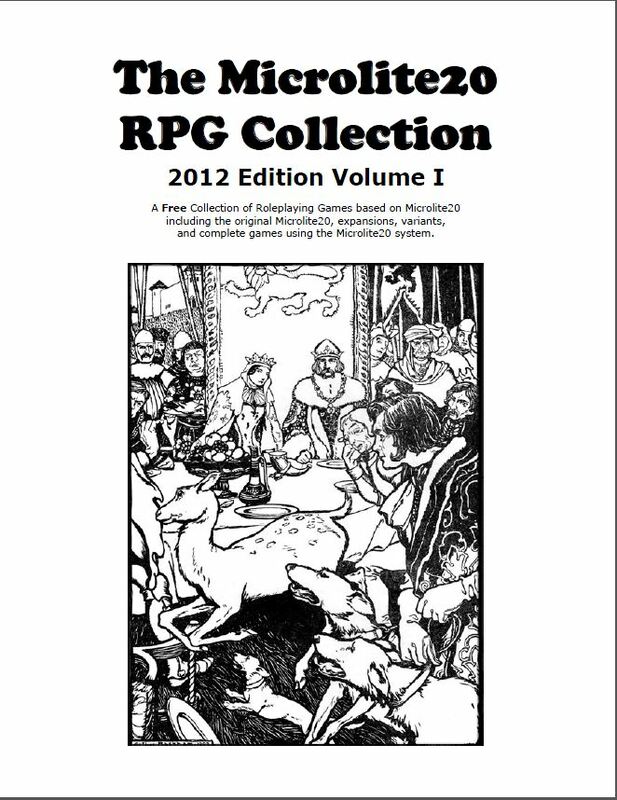 But I also found this amazing link: The Microlite20 RPG Collection. It is from 2012 and contains over 70 different games using Microlite20. Over 1300 pages, all OGL, all free. There is also a recent post listing Microlite20 Releases since 2012, including some first attempts at shrinking 5E. I dug in and read most of it. There is a plethora of settings and genres covered in various ways. Most expand on the original Microlite20 formula in one way or another. Nowadays I even find 5E too crunchy on the rules side and prefer the lightness of many old school systems; however they often have quirks that I personally do not like. For example race as class, each class with their own XP table, D6 only damage, the many different Saving throws, no skill system and other things like this. Microlite20 is the best of both worlds for me. A base so streamlined you can easily tack on other material without breaking anything, still compatible with the majority of DnD stuff out there, and gets rid of the annoyances of the games emulating the DnD of the 70s. There are Microlite20 versions for the old DnD editions as well, if you like these, it might be worthwhile to check out Microlite74 or Microlite81, both available at the Retroroleplaying Blog. I have been working on my own system inspired by BoL and other lightweight games, and unwittingly ended up with something that closely resembles Microlite20 or one of its derivatives. Currently I am looking for “Chinks in the armor”, things I do not like, but the base is so minimal and solid there does not seem to be anything. And everything I am missing I can quickly add to fit my needs. To say I am in love with the system is too much, but it is easily one of my favorite systems next to BoL. If you do not know it, please give it a chance. If you do, what is your experience with it? Did you like it? Read you soon! Maybe the right game for my pocket and a fast use. Did you have a look at it? What did you think?